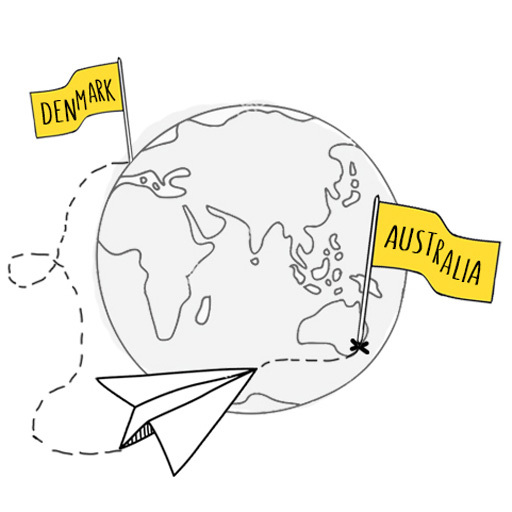 The first 6 months have gone by since we started up the office down under, lead by our sociologist Thomas Aarup Due. It has been amazing to receive great interest in our citizen consultation and co-design practices. Everyone we’ve talked to, even briefly, seems deeply engaged with the problems we seek to address. During our time here there we’ve met with numerous government representatives, public organizations and companies, who have all been enthusiastic about our work, what we do and how we do it, even if it’s just over a cup of coffee. We’re greatly humbled by all this positive response. Changing the entire setting and moving it 14.000km away has been a fascinating experience for our community engagement practices, a strictly context-driven field. As an office we’ve always had close ties with the Aussies and Kiwis, but it’s the first time we got the opportunity to embed our work in local communities and really experience the unique cultural realm. Australia presents an interesting land use model, with extreme urbanization in a land that has so much wild life and unspoiled nature – in comparison to Denmark, with it’s cultivated nature and mild urbanization patterns. As the city of Sydney is rapidly growing, the problem of urban density and responding solutions such as ‘affordable housing’ are on a completely different level than we could ever imagine in Copenhagen. One hears the banging noise of construction workers throughout the city, signaling new spaces for us to inhabit. However the lack of communication and engagement with the citizens has created an adverse relationship between the people and developers, leading to further social instability. New and more democratic ways of developing the city are a sought after commodity. It’s clear that the immense developments, happening rapidly all over Australia (especially in the cities), have left deep scars not only in the urban fabric but also in the minds of average citizens, who no longer trust developers, councilmen or any government agencies. There are some inherent challenges to starting up a new office that would be the same for any practice around the world. Building up the network, getting to know the people in the field, winning the first projects, adjusting to the routine, creating a strategy and planning for the future, for expansion, for new possibilities. These are challenges we knew we would face. But there are also some things you’d never consider before touching the red Australian soil. One of the key-factors for community engagement is to activate the existing social infrastructure of a neighborhood, institution or site. To strengthen and enrich the social infrastructure, by creating new connections between people and tapping into the local knowledge. Shifting to an AU-context it’s become quite clear that the typical communication structures and organizations, we’ve come to rely on, need to be adapted to the local conditions. We encountered the difference in social infrastructure, when Thomas was invited to do a lecture at UTS, University of Technology Sydney. The lecture was about “co-housing”, which he naturally perceived as “Bofællesskaber” – a unique Danish housing style where people choose to live together and share their everyday life including meals and shared facilities. Only a few days before the lecture did he figure out that co-housing in Australia typically means “Andelsbolig foreninger” – a way of living not perceived specifically as collaborative in the Danish context. Such realizations have been key in transforming our engagement processes in Australia, particularly while engaging with citizens in the local context. Living in Sydney, one begins to appreciate how things are structurally different. For example, the 3 layer government framework takes a bit of time to comprehend, with the national level handling some things, the state level others and finally the small councils, all of which typically hold different social and political agendas. We have the opportunity to act as mediators between these different government groups, through creating a common language using our engagement processes. Bridging the gap through such practices paves the road for the recognition of co-creation in Australia. Co-creation and participatory design are still up and coming constructs in the Australian context and our practices suggest a significant paradigm shift, which begins by bringing everyone to the table. In Sydney, an urban jungle compared to any Danish city, one doesn’t immediately notice the connection to nature that permeates the Aussi culture. But for every local, nature is an integrated part of their everyday lives, whether it’s long hikes (Bushwalks), surfing, climbing or just enjoying the amazing reservoir of unspoiled nature “just outside” the city. The warm climate calls for a laid back life-style where BBQ’s and long days at the beach are an essential part of life. One thing that has been exciting to experience is the Australian “rediscovery” of the Aboriginal culture, which for so long has been suppressed and marginalized. It’s inspiring to see how appreciating the traditional and rich Aboriginal culture is becoming the norm all over Australia. For instance, it’s quite common for a meeting or even a rugby game to commence with a “Welcome to Country”, a kind of formal, almost prayer-like, song that signifies respect for the original tribes inhabiting the land “past, present and future”. Reflecting back on one of our latest projects with outdoor education, the Aboriginal people have been using the outdoors as a classroom for thousands of years, using sheer rock as blackboards. Also their understanding of knowledge as a part of the context, relates back to our locally driven practices. Stories can only truly be told and experienced in the places they occur(ed). This is indeed a revelation to contemplate about and one that forces us to reconsider commonly accepted concepts, such as our learning environments. This is a call to take concepts such as “local heritage” or “community memories” more seriously and create historically conscious design, through stories we can only learn by involving the local people in our processes. From the AU-office we wish happy holidays to all our friends, collaborators and partners all over the Sunburnt Land and in New Zealand. Also, as surprising it is for the people back in the cold north, we wish everyone a happy summer break. We’re looking forward to many new adventures in 2018. No worries and see you later!